The author of a pioneering new book on animals and public health, published this month, claims that “as long as factory farms exist; we will continue to be at risk from bird flu”. Dr Aysha Akhtar, the author of Animals and Public Health: Why treating animals better is critical to human welfare, considers that while Bird Flu is currently receiving much attention owing to recent deaths inVietnam and its potential use in bio-terrorism. The book to be published on 17th February is the sixth volume published as part of the Palgrave Macmillan Animal Ethics book series in partnership with the Oxford Centre for Animal Ethics. In a lively manner, this book describes the link between the way we treat animals and human health across a wide range of health topics. Dr Akhtar explores the lives of animals in violent homes, factory farms, experimental laboratories, the entertainment industry and the wildlife trade. She reveals how their treatment is related to issues as diverse as domestic violence, the obesity epidemic, the world’s most ominous infectious diseases, animal attacks, high-profile drug failures and climate change. 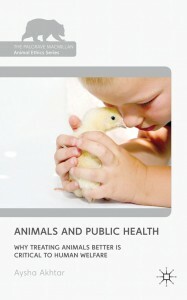 In the first academic text to address the relationship between animals and public health, Dr Akhtar argues that “… public health has long-ignored the relationship between our health and animal treatment, largely owing to a misconception that animal welfare is in opposition to human welfare”. Using a wealth of scientific information, the book demonstrates that in order to best promote human health, we have to improve our treatment of animals. Dr Akhtar hopes that this book will lead to a new public health paradigm, one that considers animals as part of the “public” in public health. Aysha Akhtar, M.D., M.P.H., is a neurologist and public health specialist and a Fellow of the Oxford Centre for Animal Ethics. She works for the Office of Counterterrorism and Emerging Threats of the U.S. Food and Drug Administration. The book is written in her personal capacity and is the result of many years of scientific research. The Palgrave Macmillan book series is jointly edited by the internationally known theologian the Reverend Professor Andrew Linzey, Director of the Oxford Centre for Animal Ethics, and Professor Priscilla Cohn, Emeritus Professor in Philosophy at Penn State University and Associate Director of the Centre. Animals and Public Health: Why treating animals better is critical to human welfare, is published on 17 February in both theU.S. and theU.K. priced USD 85 / GBP 50. For more press information please contact Samantha Calvert, Samantha Calvert Marketing & PR on +44 (0)1782 505430 / +44 (0)7967 042050 / sam@samcalvert.plus.com or Lindsey Ruthen, Associate Publicist, Palgrave Macmillan, on +1 (646) 307-5659 / Lindsey.Ruthen@palgrave-usa.com.